It’s no surprise that I like upcycling things to better suit my needs. My $12 singer sewing machine table is seriously one of my favorite pieces of furniture I have in my house…until now! 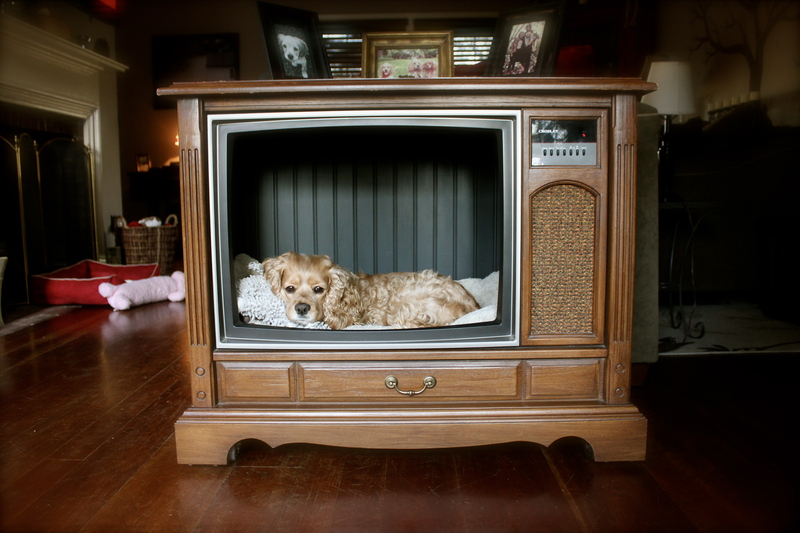 A few years ago, I saw a picture online somewhere of an old console Tv made into a dog bed. I thought it look awesome but after a few months I forgot all about it. Until a couple months ago when I was on Pinterest again and saw the same exact picture. Then I was on a mission to find an old console Tv. To my surprise, they aren’t the EASIEST things to find, especially in decent condition (if interested, start on Craigslist!) They also come in so many styles it’s ridiculous…so it was even difficult to find one that was physically appealing to me. So, I kind of gave up searching for a little bit. To my ultimate surprise on Christmas Eve, there was a present addressed to the dogs and I. It was my console Tv…in perfect condition…in the perfect style!! Does my boyfriend know me or what?! What’s awesome about it is 1. it was free (I KNOW! RIGHT!?!) 2. 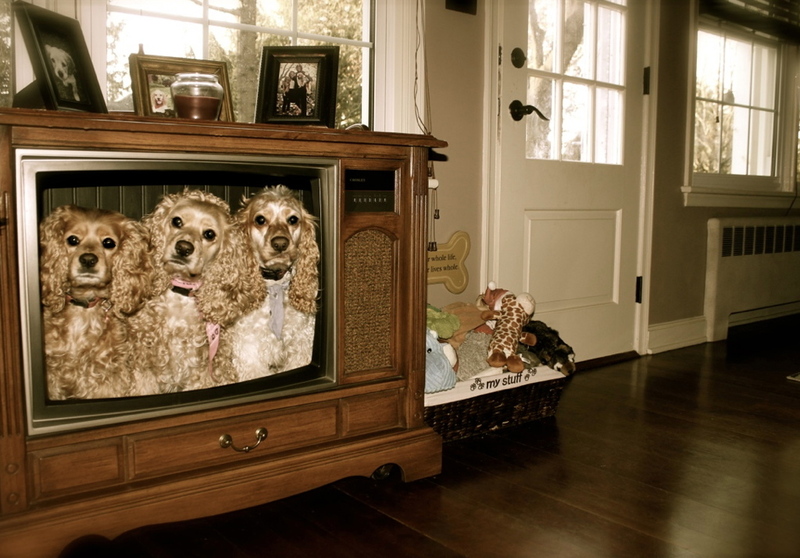 Pete didn’t have to empty all the Tv junk out of it! Apparently, someone he works with (obviously, the coolest guy ever) either put an ad on Craigslist or knew a Tv guy (can’t remember, I’m horrible) who actually empties out old televisions and either sells the parts or recycles them. Then the guy just showed Pete pictures of all the televisions he came across and Pete picked out his favorite one and then they delivered it. How freaking awesome is that? So here it is, in all of it’s glory! The only thing Pete changed on it was lined the inside of the Tv with black bead board and it looks perfect now. As you can see, all of the dogs love it and it looks awesome! 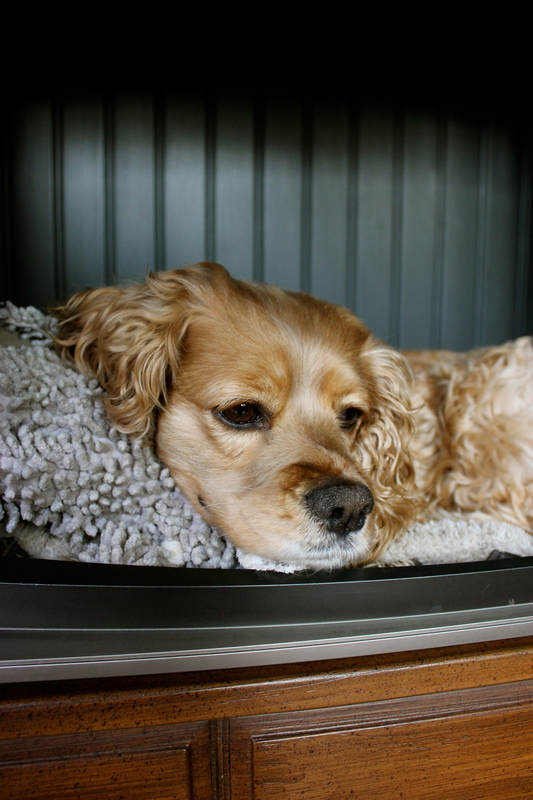 Wren has definitely claimed it as her own bed though…she is in there all the time. Can’t tell you how much I love this piece of furniture, hope this inspires someone to think outside the box when looking for furniture for their home!! 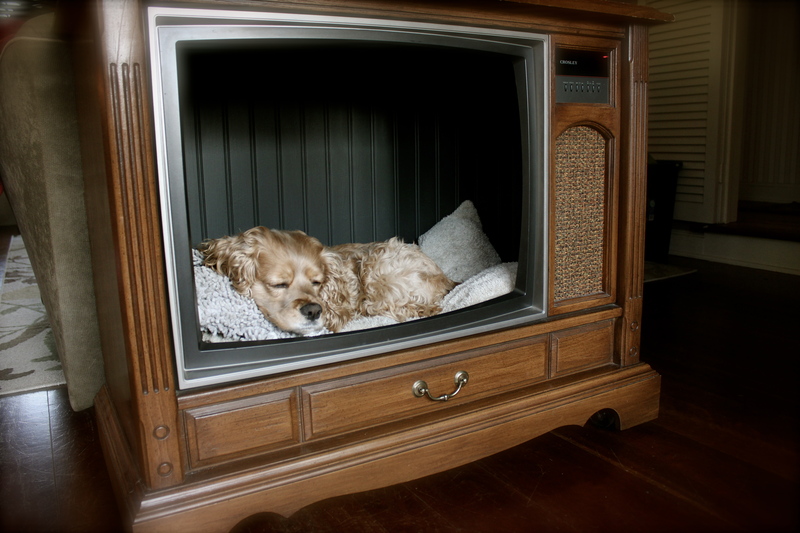 Posted in Home Sweet HomeTagged console tv, dog bed, upcycleBookmark the permalink. Very creative and cute ! How creative is this! Love it.